Draupadi was the daughter of Drupad, who was a king of Panchala. As we all know in Mahabharat Draupadi was the wife of five Pandavas. Draupadi was also called as Panchali in Mahabharat. Draupadi brother was Dhrishtadyumna. Draupadi and Pandavas relationship was very beautiful and Drupadi showed equal love and affection towards all her five husbands. Draupadi birthplace was Panchala. 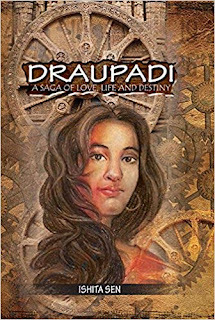 Draupadi was born when Drupad was doing Putrakameshti Yagna. Draupadi came out from the holy fire as a dark-skinned woman. Draupadi was a very beautiful woman. She also possessed some qualities like braveness and intelligence. Throughout her life, she lived as a good human being and always followed dharma. Draupadi also felt Lord Krishna as her brother. That's there was a sister-brother relationship between Draupadi and Krishna. When Draupadi turned as a young woman, Drupada wanted to make the Draupadi marriage. So Drupada wanted to conduct Draupadi Swayamvara. Draupadi Swayamvar started with a grand ceremony. So many kings attended to that Swayamvara. All kings wanted to win in Swayamvar and wanted to marry Draupadi. Some of the names of the kings presented at the ceremony are Karna and Pandavas. Pandavas attended the ceremony in the form of Brahmins because they were in exile at that time. Some of the big names like Lord Shri Krishna, Balarama, Duryodhana also presented there. There was a challenge to win the hand of Draupadi. The challenge was to hit fish eye while it was revolving on the top side of the pole. But that condition was to not hit the fish directly but they need to hit the eye of the fish by seeing the reflection of the revolving fish in the water. There was also one problem with a bow because it was a very heavy bow and only fewer people had the ability to lift that bow. Here comes the Dhrishtadyumna, the brother of Draupadi and announced about the challenge and also explained the rules and conditions to win the challenge in the right way. He said like that those who hit the eye of the fish would get the Draupadi. Then the real challenge started, so many kings were tried including Duryodhana and remaining Kauravas but they failed to even lift the bow. It seemed to be a big task for them to lift the bow and put an arrow on to it. Then here comes the Karna, almost the best archer along with Arjuna in Mahabharata. 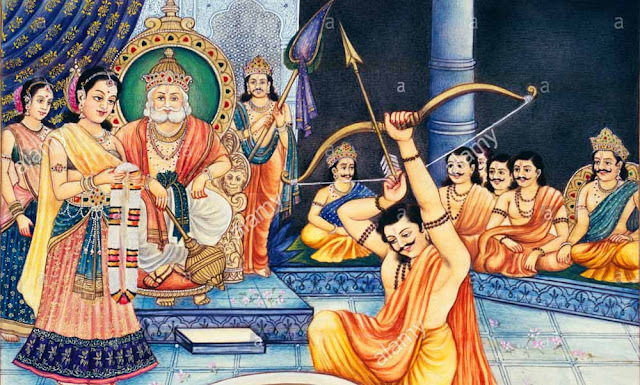 Before Karna was trying to lift the bow, suddenly Draupadi interfered and said like this, "I do not want to marry the son of the charioteer and she only wants to marry the king who belongs to Kshatriya dynasty". After hearing those words, Karna felt sad and left the ceremony immediately. It seemed to be difficult for all the kings to break that challenge. Now, one of those five Brahmins had come to the front and wanted to give his try in the challenge. He was nothing but the Arjuna, the best archer in Mahabharata. All people presented in the ceremony had some hesitation how this Brahmin could break that challenge. Arjuna easily lifted the bow and prayed to the God and fixed arrow on to the bow. Arjuna aimed the bow to the top side of the pole where fish was hanged. Arjuna started staring at the reflection of the fish in the water. Arjun shot an arrow to the top side and that arrow hit exactly the eye of that fish and fish hade been fallen down on the earth. 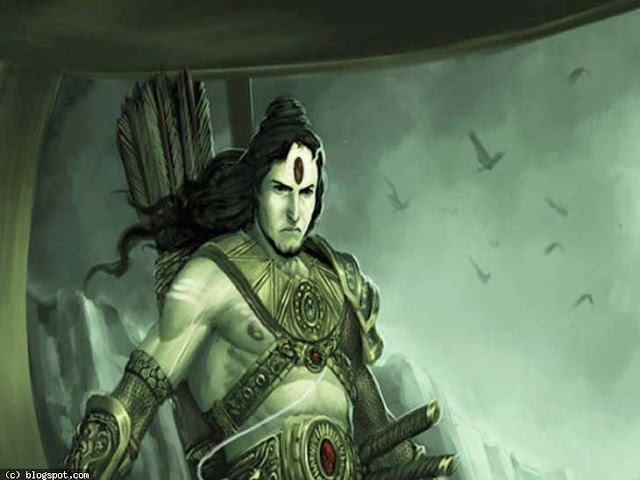 Arjuna achieved the feat with great ease and archery skills. All kings presented at the ceremony started praising that unknown Brahmin and started applauding him. Celebrations were started for the marriage of Draupadi and Arjun. Draupadi was so happy and her heart was filled with joy because she knew that he was Arjuna in the form of Brahmin. She got the reward what she wanted because she already wished in her heart to marry Arjuna. But suddenly kings started protesting that how Kshatriya woman could be married to Brahmin. The situation became worst due to the anger of all kings. Remaining four Pandavas were protected Arjuna and Draupadi safely and made them come out safely from out of that ceremony. In this way in Mahabharat Draupadi Swayamvar ended. After Pandavas and Draupadi came to Kunti, Arjuna called her mother by saying like this, "come and see mother what I brought". But Kunti replied from inside the hut by saying like this, "share whatever you brought along with your brothers because you five have same authority on that". Kunti thought that Arjuna brought the food so she said like that by mistake. After Kunti came out and saw the Draupadi and understood the situation and felt very sad because she said to share here along with five Pandavas. But those words could not be taken back so Draupadi became the wife of all five Pandavas. This is What Happened Exactly During Draupadi Swayamvar in Mahabharata. There are so many best books available about the life history of Draupadi and her brave qualities. Out of those all books, I will suggest you best Draupadi book here.